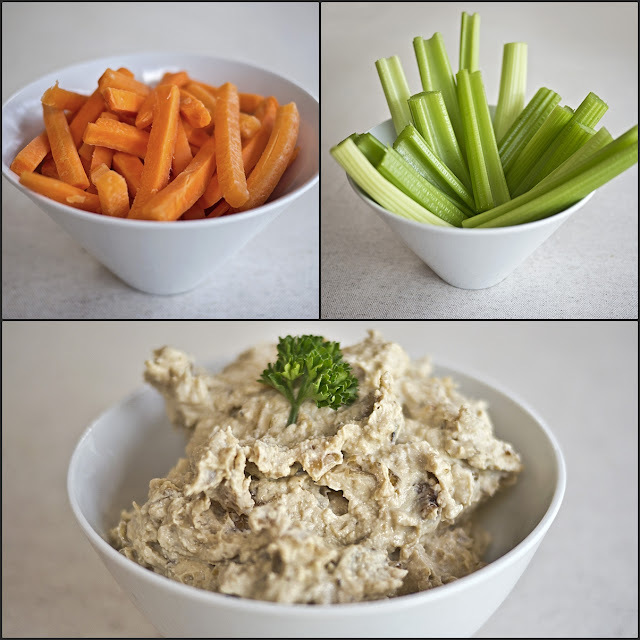 This low fat, syn free dip is delicious with carrot batons and celery sticks; or you could use it as a filling for jacket potatoes. By adding some water or lemon juice to it, you could turn it into a salad dressing; or it would be nice tossed with some hot pasta or vegetables – but don't let it boil as it will curdle. Sauté the onions in a little Fry Light over a low heat until caramelised, probably about 20 minutes or so. Don't let them become too brown. Cut the papery top off the garlic bulb to reveal the cloves and spray with Fry Light. Bake for 20-30 minutes at 220°C, until the garlic cloves are nice and soft. Scoop the soft centres out by squeezing with your fingers, using a knife or small spoon to remove any stubborn bits. Place the soft garlic mass and half the onions in a liquidiser with a little water (ca 1 tbsp) and blitz until smooth. Mix into the quark with the spices and the rest of the onion. Stir well, taste and adjust seasoning if necessary.